That there are only problems as far as you can see, and joy seems unattainable? I have. Many times. It’s as though I’ve looked through the fog and wondered if there was any way out. As though joy was a far off thing that happened in another life, or only happened to other people. When you’re in that place, when it seems that joy can’t be found, it’s heartbreaking and overwhelming. It’s soul crushing. But we can forget one simple truth found here in Psalm 51. The joy of my salvation outweighs all difficulty. That might seem like a glib statement when you’re feeling crushed by the weight of sadness. But it is a truth from God’s Word. Do you really believe it? Do you believe that the joy of salvation can be found at all times? I guess it comes down to what you believe about salvation. When you really think about it, if you’ve accepted the free gift from God, you will live forever in eternity with Him. Eternity. Forever. Those are big words. Weighty words. Words that outweigh anything here on earth. When compared to trials here, which are described as temporal and as a vapour, salvation is far more weighty. But in order for the joy of our salvation to outweigh the trials here, we need to find the joy. 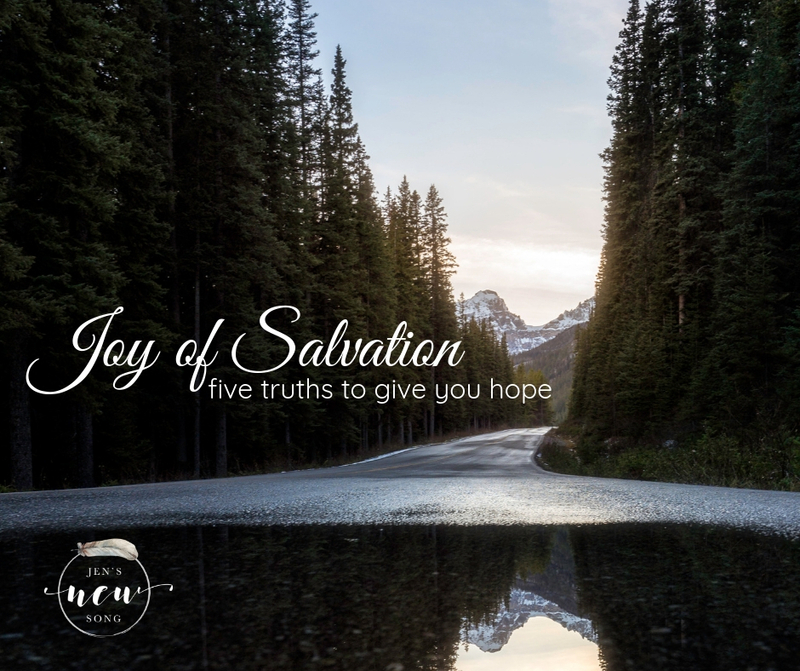 How does one find the joy of their salvation? I think the first clue we have from this verse is to simply ask. The Psalmist is asking God to restore the joy of his salvation. In the middle of trials, in the middle of a difficult life, he’s lost the joy. He’s allowed this temporal, earthly life to outweigh the eternal. So he simply asks God to restore the joy. And God will. We miss out on so much help from God because was neglect to simply ask. God is not up in Heaven asking us to live without joy. Does He ask us to walk though some hard things? Absolutely. But never without His joy. Never without His help. It’s always available, always there for the asking. Secondly, this joy focuses on the eternal. This is not some temporal joy. Not some joy brought on by circumstances, by temporal pleasures, by earthy possessions. This joy that outweighs all circumstances here, must be eternal. This is the joy of our salvation. The joy of the eternal. The joy of fellowship with God Himself. The joy that tells us, no matter what happens in these few short years here, there will be an eternity of bliss. It is a joy of hope. Hope that in the future all will be made right. That there will be rest. And perfection. And that the joy of heaven will someday erase all that has happened here. That someday is not here yet. For now, we will walk and work and live in the temporal. We still live in pain and grief and difficulty. For now, the joy will not yet erase the sadness. But it does outweigh it. If we let it. We can live in that dichotomy of joy and sadness at the same time. We can walk those hard roads, live in those difficult circumstances, struggle through the temporal, all while looking toward heaven and remembering what awaits us. But only if we focus on Heaven. On the eternal. On the joy of our salvation. This is the first in a series of five essential truths to give you hope when you need it. 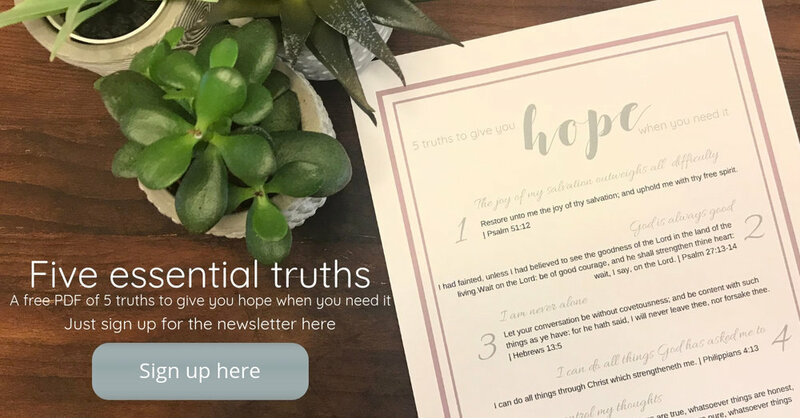 If you would like a printable of all five along with verses to meditate on, click on the picture below and sign up for the newsletter. The printable will be delivered right to your inbox!